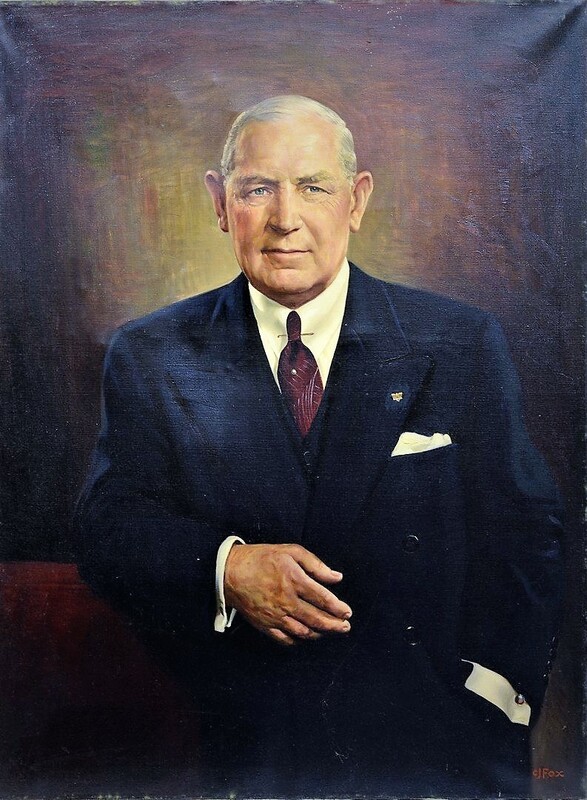 Henry J. Hardenbergh, remembered for his imposing structures like the Dakota Apartments and the Plaza Hotel, was among Manhattan's most esteemed architects. 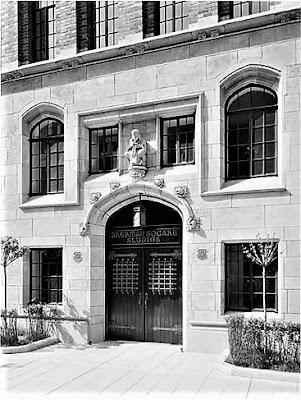 But his 1881 row of eight houses on West 73rd Street, between Columbus and Amsterdam Avenues, was decidedly out of fashion when Walter Russell eyed the site for a new project in 1927. Russell was, by profession, a portrait painter. But just before the outbreak of World War I he added real estate development to his resume, forming the Walter Russell Bond & Realty Co. His firm got into the relatively recent "studio building" trend, which erected structures especially designed for artists and musicians. 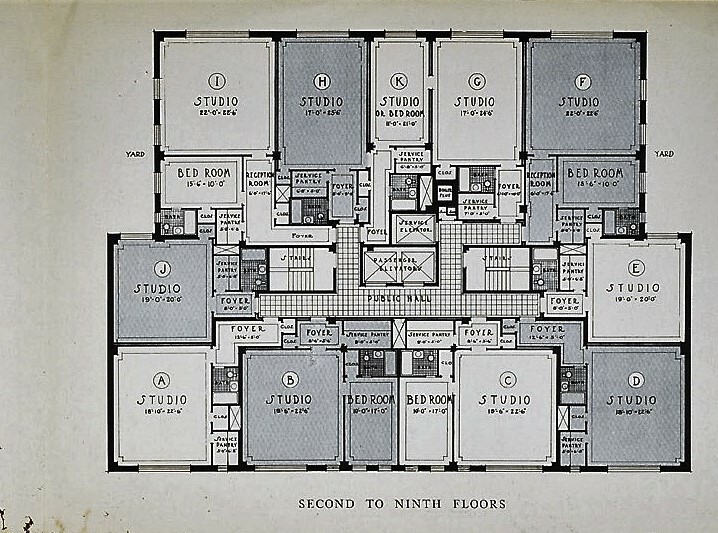 The apartments included both living and studio space. Architect Philemon Tillion had worked on his own before bringing his son, Philip, and later his son Clement, into the business. Despite there being three Tillions involved in the partnership, the firm took the name Tillion & Tillion. Walter Russell hired the firm to design the Sherman Square Studios which would replace six of Hardenberg's houses--Nos. 158 through 168. Construction began in May 1928 and would continue for a year. Tillion & Tillion's 14-story design was a modern, Art Deco take on Gothic. A two-story stone base supported the brownish-red brick upper stories. Thin, full-length brick piers rose to the several setbacks, adding verticality to the design. Their blunt stone caps were an Art Deco modification of what would have been spiky finials in true Gothic structure. Vast windows, so necessary in artists' studios, admitted the south-after northern light. The 1929 real estate brochure pictured a sunlight-flooded studio. 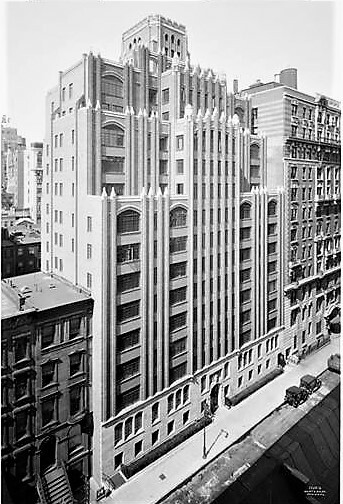 As construction commenced, The New York Times described the coming building "for painters, illustrators and musicians." Tillion & Tillion had promised that it "will be scientifically sound-proofed, even to the doors." Not only were the dividing walls doubled and insulated, but the studios were separated from the living quarters in abutting apartments by "waiting rooms, pantries, bathrooms," and similar spaces. The Times felt that "In these days of radio, the sound-proof building should be an interesting feature for all classes of buildings." Like almost all studio buildings, the Sherman Square Studios would be cooperative. A remarkable feature would be its "free cooking service." The salaries of the cooks in the main kitchen were part of the building's operating expenses. The Times article noted "the tenants' food may be prepared for them and sent to their rooms in heated containers." Russell knew that a painter or composer, deep in concentration or in the midst of instruction, disliked distraction. 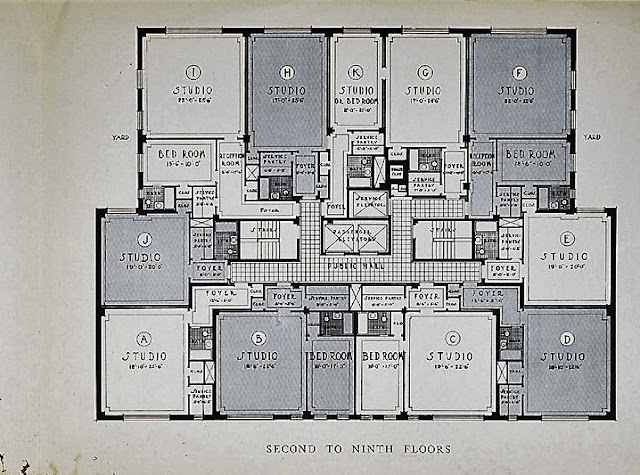 He therefore had an "electrical signal service" included in the plans which connected each apartment with a "general secretarial room" on the ground floor. The Times explained "This feature will be especially valuable for teachers of music and painters who do not wish to be interrupted in their work, but whose business messages will be attended to by the general secretary." The Sherman Square Studios was completed in April 1929 and Tillion & Tillion's soundproofing was put to the test. At 3:00 on the afternoon of April 14 a committee of musicians, engineers and city officials assembled in an apartment. 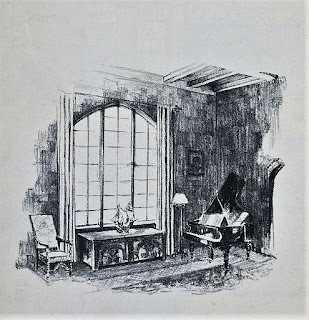 In the studio next door soprano Pauline Lawn, tenor Giacamo Lauri-Volpi and pianist Myra Hess went into "lusty vocal and instrumental music." The committee strained to pick up any sounds that might seep through the walls. The architects' system worked. As intended, The Sherman Square Studios filled with artists and musicians. Their studios were not only used as work or teaching spaces, but for lectures, concerts and recitals. Pianist Bernard Gabriel routinely held lectures in his studio. On January 6, 1932, for instance, he spoke on the piano music of modern French composers, while playing to illustrate his points. The following week his lecture was on "The Piano Music of Present-Day Composers." 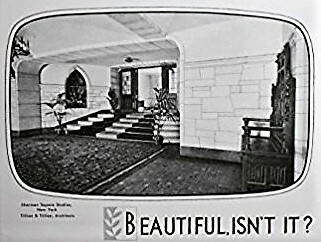 A 1930 advertisement depicted the lobby with a large rug and carved bench. Soprano Louise Weigester lived here with her husband, Robert. Her studio housed the Louise Weigester School for the Training of Children's Voices. On the evening of January 24, 1935 she held a lecture on "voice training for children." And similarly, pianist, composer and teacher Marcella Geon, gave a lecture-recital on "Tristan und Isolde" on the evening of April 14, 1938. One surprising resident in 1933 had nothing to do with the arts--at least not initially. Hector B. DeSaa had been the attache of the Venezuelan diplomatic service in Havana. In April that year he went to the Club Richmond with a close friend, Mario Montealegne, who was the son of the Prime Minister of Costa Rica and the Secretary of Costa Rica's legation in Washington. While there Montealegne introduced the 24-year old to Gilda Gray, a dancer and former motion picture actress. He was smitten. Gilda was famous among American audiences for her signature dance, the shimmy. In every one of her film appearances she danced the shimmy, as her fans expected. She was 32 and twice divorced when she met DeSaa. Their romance ignited and they were married three weeks later, on May 23. A bizarre incident occurred on March 14, 1940 involving resident Emanuel Eisenberg, described by The New York Times as "one of the best known theatrical press agents in New York." The previous night Eisenberg had stayed up talking with playwright John Murray until 5 a.m. Murray later said they discussed Eisenberg's "literary problem" which was "whether to continue work as a press agent or to complete a novel begun some years ago." Murray slept over and when he arose at noon he found Eisenberg dressed and ready to leave. Eisenberg had mentioned in passing the night before that he wanted to take flying lessons, but Murray dismissed it. He did, however, notice his friend seemed "confused." Unknown to his friends, Eisenberg had convinced himself that he had a brain tumor, despite his doctors' refuting his self-diagnosis. One, Dr. A. O. Tumen, described him as "erratic and unpredictable" and "a particularly sensitive soul, who just doesn't belong among ordinary people." That afternoon Eisenberg headed to Floyd Bennett Field where he signed up for flying lessons at the Standard Flying Service. His instructor, Joseph Rosemarin, took him up in a Piper Cub monoplane. When they were over Prospect Park in Brooklyn, Eisenberg jammed the stick, sending the plane into a dive. Rosemarin fought to regain control, finally knocking Eisenberg over the skull with a pair of pliers. Eisenberg, bleeding, quieted down and claimed "I'm all right." Rosemarin piloted the plane while his student, he later reported, "began to mumble meaningless phrases." Suddenly Eisenberg was back up, battling for the controls. The New York Times reported "The passenger rained blows on the pilot, who frantically stuck to his task of piloting the ship." The plane spiraled down towards the bay, where Rosemarin made a "pancake landing" in the water. He broke through the canvas roof of the cabin and climbed onto a wing where he was rescued by a tugboat. Eisenberg did not survive. Bernard Gabriel was still in the building in 1942 when he organized the Society of Timid Souls which met in his studio. Recognizing that many highly-talented musicians suffered from stage fright, his self-help group was intended as a cure. For 75 cents (to cover refreshments) artists were encouraged to "play, to criticize and be criticized, in order to conquer the old bogey of stage fright," according to The New York Times. Unable to make a living in the United States with his abstract paintings, he became the ghost-painter for Charles J. Fox. It was an extraordinarily peculiar arrangement. Fox received his first commission with the United States Congress in 1943. Over the years his signature would appear on the portraits of 10 Capitol Hill portraits and literally hundreds of other official portraits. But they were actually the work of Irving Resnikoff. Resnikoff's portrait of Hobart C. Ramsey, bears the signature of C. J. Fox. Fox would bring Resnikoff photographs of the subject and the artist would produce dignified oil portraits which Fox would then sign. The deception was not uncovered until 1978 when the Internal Revenue Service billed Fox for back taxes. Fox's defense was that he could not paint portraits and was merely a corporation which sold the paintings and not liable for the higher, personal taxes. On the fall of 1950 Dietch took on a well-known student. The New York Times reported on November 28 that "Margaret Truman, the President's singing daughter, has changed music teachers again." Margaret's decision to change coaches--again--may have had to do with the critique that appeared earlier that year in the Washington Post. Music critic Paul Hume had written "She is flat a good deal of the time. And still cannot sing with anything approaching professional finish." President Harry Truman was not pleased with the slight to his daughter. He wrote to Hume "Some day I hope to meet you. When that happens you'll need a new nose, a lot of beefsteak for black eyes, and perhaps a supporter below!" In reporting on the coach change, The Times article said "Everyone involved was reluctant to discuss the situation yesterday. Miss Truman was not available for comment, but her manager, James A. Davidson, said that Mr. Dietch would serve both as a musical supervisor and coach." Other notable tenants at the time included Robert Payson Hill, pianist and organist, who had had a pipe organ installed in his apartment. His wife, Genevieve Rowe, was a soprano, and he often acted as her accompanist. Lee Sims and his wife, Ilomay Bailey, lived here. He was a pianist and composer and she was a singer. By now they both taught in their studio. But theirs was a fascinating story. Following their marriage they formed a team and had replaced Eddie Cantor in the 1930s as stars of the "Chase and Sanborn" radio program. Sims's wide-ranging career included writing musical scores for several movies, an appearance with the London Symphony Orchestra to play his symphonic tone poem "Blythewood," his own N.B.C. radio program, "Piano Moods," and appearances in vaudeville and night club acts. Lee Sims died in his apartment on May 8, 1966. Over the decades celebrated names in music and art passed through the doors of the Sherman Square Studios. In her 2013 book The Society of Timid Souls, author Polly Morland mentioned "It went on to become well known as home or workplace to a host of stellar names from the world of music--including Leonard Bernstein, Ginger Rogers, Liza Minnelli, Barbra Streisand, and Lotte Lenya." Externally little has changed to Walter Russell's 1928 Sherman Square Studios. Inside occupants can no longer accept "cooking service" or a residents' secretary. Times, unfortunately, change. Sigh of relief! The building, with its fascinating stories, survives.